We’re always looking for authors to contribute and seek a diverse set of essays, on a wide range of philosophical issues, questions, figures and traditions. If you’re interested in contributing a 1000-word essay (or essays) on a philosophical topic that interest you and that you think would interest our readers, email us. Please either send us your full essay for review, or an essay proposal, or any other inquiries regarding the appropriateness and desirability of your topic and approach. We are especially interested in essays on topics frequently addressed in introductory courses, as well as topics that are difficult to cover in introductory courses because the relevant literature is difficult for first-year students. We especially welcome material addressing under-represented philosophical traditions, including global philosophy, philosophy of race, LGBTQIA issues, and more. A Call for Papers flyer is available here. A submission template is available in Word and Google Docs. Why contribute? 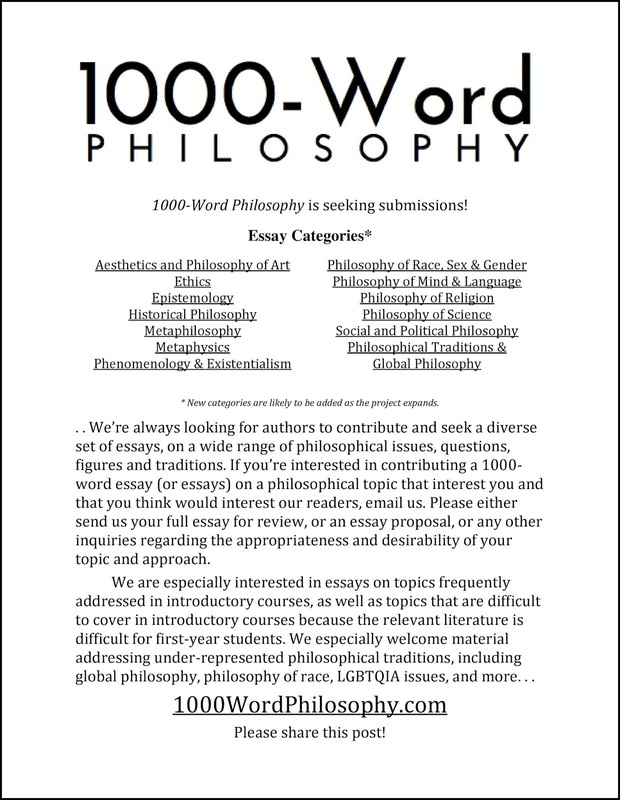 1000-Word Philosophy currently has a few hundred online visitors each day, and we are working to increase those numbers, so your essay will be highly visible to a global readership. We are also looking into ways to try to track the use of the essays, for example, in teaching and as sources for online discussion. We are also planning to eventually compile the essays into an open-access and open-source print collection that will be ideal for classroom use, as well as the general reader. If you are interested in developing ideal materials for both teaching and public philosophy, then 1000-Word Philosophy is for you. Do you have a very good purpose for which this domain name -- PhilosophyofRace.com -- would be useful for? If so, contact me and we can talk about transferring it. This book's original purpose (clear, well-organized introductory readings on philosophical issues about race) would be well served if anyone would write and submit (and publish) more writings and presentations on philosophy of race either at 1000 Word Philosophy, the Internet Encyclopedia of Philosophy and/or WiPhi, at least! (I have no official connections to most of these webpages; here I merely suggest that authors consider developing materials on philosophy of race for them). Different theories on what races are (biological theories, social theories, etc.). Mixed race: if races can be 'mixed', this seems to say something about what they are. Eliminativism or conservationism about race. Something on whiteness or white privilege. Racism: what is racism? Different theories on the nature of racism. Is there any kind of racial preferences that are not wrong? The following resources provide information about diversity and inclusiveness within philosophy as well as strategies and best practices for improving the climate in the field for women, people of color, and other underrepresented groups. If you have a resource you would like to see added to this list, please send us your suggestion. The APA's board of officers recently created a task force on diversity and inclusion, chaired by Elizabeth Anderson. The task force welcomes suggestions from members of the association and the profession. The Committee on Inclusiveness in the Profession has launched a collection of syllabi related to diversity and inclusiveness. The syllabi are now available and may be used as a resource for those teaching philosophy to create more diverse and inclusive courses. See the collection of diversity and inclusiveness syllabi and learn how to submit your syllabus. A report on APA membership demographics for 2013-2014 is now available. For a number of years, there have been calls for the APA to improve and increase its tracking of member demographics. We are very pleased to now be able to provide this kind of information to and about our membership. Though, for this first year of reporting, the information provided is somewhat limited, we plan to expand and increase the data reported in future years. We welcome feedback and suggestions for improvements to our collection and reporting of demographic data. Suggestions may be emailed to membership@apaonline.org. There are a number of undergraduate diversity institutes supporting and encouraging students from underrepresented groups—such as people of color, women, LGBT+ people, people with disabilities, and people from economically disadvantaged backgrounds—studying philosophy. These institutes help introduce undergraduates to philosophy as a career and help prepare them for graduate school. Learn more about undergraduate diversity institutes in philosophy. Four color posters (8.5"x11") with basic information on the major undergraduate diversity institutes in philosophy. Who Studies Philosophy?Color poster (11"x17") featuring well-known people who have studied philosophy. Features public figures in business, government, journalism, entertainment, and other fields. Advice for Undergraduates from Underrepresented GroupsWe asked graduate students and professional philosophers from underrepresented groups, "What advice would you give to underrepresented groups who are considering graduate study in philosophy?" This series of four black-and-white flyers (8.5"x11") features their answers. 5 Ways to Be More InclusiveThis info sheet outlines five simple changes you can make to be more inclusive in your department or in your classroom. This info sheet lists a number of articles to read for more information about diversity in philosophy. PIKSI Ambassadors Program FlyerThe PIKSI Ambassadors Program brings alumni of the Philosophy in an Inclusive Key Summer Institutes (PIKSIs) to visit philosophy departments and talk with undergraduates about the value of participation in undergraduate diversity institutes. See this flyer (8.5"x11") for more information. The APA offers several sources of travel funding for members of underrepresented groups. This flyer (8.5"x11") contains information about each of them. This color flyer (8.5"x11") provides information about the role of the APA Ombudsperson Concerning Discrimination and Sexual Harassment. These templates allow you to fill in the relevant information for your institution or department about resources relating to sexual misconduct and discrimination. In color or black and white. This color flyer (8.5"x11") lists the best practices for preventing and addressing sexual harassment in professional academic philosophical settings. A 2012 article published in the Journal of Social Philosophy that examines the problems that neoliberal thinking has on diversity and the field of philosophy. Jennifer Saul on the psychological biases adversely affecting philosophy—and what we can do about it. "Wanted: Female Philosophers, in the Classroom and in the Canon" by Regan PenalunaIn an article from the Chronicle of Higher Education, Regan Penaluna looks at some of the contributing factors to the lack of diversity in philosophy. A 2008 article by Sally Haslanger discussing the situation for women in philosophy. An article by Kathryn Norlock published in the Journal of Social Philosophy, Vol. 43, Issue 3 (2012). A report from 2011 that describes the state of the field for women in the United Kingdom. An article by Linda Martin Alcoff on the role of women in philosophy. A draft of an article by Helen Beebee, forthcoming in Women in Philosophy: What Needs to Change? Edited by Fiona Jenkins and Katrina Hutchinson. An article by Jennifer Saul (draft), forthcoming in Women in Philosophy? What Needs to Change? Edited by Fiona Jenkins and Katrina Hutchison. Articles by Bernice R. Sandler, Senior Scholar at the Women’s Research and Education Institute, about the climate for women in education. An article on forthcoming research on the gender gap in philosophy, published by NPR. An article by Rachel McKinnon published in the Chronicle of Higher Education. "Quantifying the Gender Gap: An Empirical Study of the Underrepresentation of Women in Philosophy"
An article by Molly Paxton, Carrie Figdor, and Valerie Tiberius published in Vol. 27, Issue 4 of Hypatia (November 2012). "Coming Out in Class" by Rachel McKinnonAn article by Rachel McKinnon published in the Chronicle of Higher Education. An article by Louise Antony published in the Journal of Social Philosophy, Vol. 43, Issue 3 (2012). While this report, produced by LGBT+ Physicists, does not focus on philosophy, the best practices put forth in the report are applicable to the field. Diversity Reading List in PhilosophyThe Diversity Reading List collects high quality texts in philosophy, written by authors from under-represented groups. Its aim is to promote the work of such authors and facilitate finding and using their texts in teaching. A group blog of Chinese and Comparative philosophy. Its primary purpose is to promote and stimulate discussion of Chinese philosophy and cross-tradition inquiry among scholars and students of philosophy, whatever their level of training. Feminist PhilosophersA blog about feminist philosophy, with the goal to help feminist philosophers keep up with philosophically relevant facts and examples. This blog considers how to make the climate in philosophy departments and other professional spaces more hospitable. A post from the Feminist Philosophers blog about making conferences accessible to individuals with disabilities. A blog by Michael Gillan Peckitt, a disabled philosophy researcher. What is it like to be a Woman in Philosophy?A blog featuring anonymous, short submissions from readers about life as a woman in philosophy. What We're Doing About What It's LikeA blog about the changes and positive steps being taken for women in philosophy. A blog to raise awareness about disabled philosophers. This is what a philosopher looks like… a photo blog documenting the diversity in the field of philosophy. A post on New APPS blog by Professor LK McPherson. A forum for philosophers and other scholars to discuss academic work and current affairs with race and gender in mind. A blog post from the Feminist Philosophers detailing how to sign up for the listserv. A group for the LGBT community and friends to meet together once a month in New York City to discuss philosophy. SSAP was established to provide a network of support for young African American philosophers and other intellectuals in the academy, to bring together alternative voices to de-center the predominant 'Eurocentric' focus of and lack of diversity in most academic philosophy departments, and to provide a place for lay intellectuals to exchange ideas with professional academics in an informal setting. The Society for Philosophy and Disability, or SPD, is a non-profit educational organization dedicated to furthering research and teaching on philosophical issues related to disability and to promoting inclusiveness and support for people with disabilities in philosophical education and in the profession of philosophy. The landing page for SWIP which works to promote and support women in philosophy. The site has articles, statistics, and course syllabi in feminist philosophy. Information about a private Facebook group for LGBTQ philosophers and students. Association of Chinese Philosophers in North AmericaAn academic organization dedicated to promoting the philosophical activities of the Chinese philosophers in America. The WPHTF is an umbrella group that works to coordinate initiatives and intensify efforts to advance women in philosophy. The Facebook group for SYBP. CBWP is a philosophical organization whose purpose is to encourage and foster a networking and mentoring relationship between the underrepresented Black women in philosophy including undergraduate students and graduate students, as well as assistant, associate, and full professors in the Academy. Minorities and Philosophy (MAP) is a collection of students in North American philosophy departments that aims to examine and address issues of minority participation in academic philosophy. Though primarily led by graduate students, MAP also relies on faculty support and encourages undergraduate participation. The Mentoring Project aims to build long-term mentoring relationships between eminent senior women and junior women in the field of philosophy. Find out your implicit associations about race, sexual orientation, disabilities, and more. Bookshare® is an online library of digital books for people with print disabilities. Bookshare Members download books, textbooks, and newspapers in a compressed, encrypted file. They then read the material using adaptive technology, typically software that reads the book aloud (text to speech) and/or displays the text of the book on a computer screen, or Braille access devices, such as refreshable Braille displays. The Rutgers Department of Philosophy believes that a crucial part of supporting and maintaining a thriving department climate for women and underrepresented groups in philosophy is making information and resources accessible to current and prospective students, and that an important part of creating and developing an excellent professional philosophical climate for all philosophers is making information on implicit bias and stereotype threat, how to counteract them, and departmental and professional statistics more publicly accessible. A week-long institute designed to encourage undergraduate students from underrepresented groups to consider future study in the field of philosophy. The British Philosophical Association and Society for Women in Philosophy (UK) Good Practice Scheme aims to assist UK philosophy departments, learned societies and journals in ensuring that they have policies and procedures in place that encourage the representation of women in philosophy. An organization looking to bring together philosophers from different disciplines to collaborate on the issue of implicit bias. Know Your IX is a campaign that aims to educate about Title IX rights and protections. Its resources include a guide to reporting sexual assault and harassment. The STRIDE Committee provides information and advice about practices to maximize the likelihood that diverse, well-qualified candidates for faculty positions will be hired, recruited, retained, and promoted. The ADVANCE Program aims to assist the University of Michigan in gaining a more diverse faculty. The McNair Scholars Program is a federal TRIO program funded at 200 institutions across the United States and Puerto Rico by the U.S. Department of Education. It is designed to prepare undergraduate students for doctoral studies through involvement in research and other scholarly activities. McNair participants are either first-generation college students with financial need, or members of a group that is traditionally underrepresented in graduate education and have demonstrated strong academic potential. The goal of the McNair Scholars Program is to increase graduate degree awards for students from underrepresented segments of society. This intensive one-week program will offer 10 students the opportunity to explore an exciting research theme in Logic (Paradoxes). Students will receive tutoring in formal techniques, mentoring, support for professionalization, and experience validation, understanding and advice regarding diversity issues they have encountered. The APA's fact sheet on minorities in philosophy. The APA's fact sheet on women in philosophy. A 2011 list of tenured/tenure-track faculty. Women & PhilosophyA collection of data and resources collected by graduate student Elena Spitzer. On 2/27/16, I sent out emails to contributors saying that, for a variety of reasons, and with a heavy heart, I am stopping work on this book project. I do hope to find another way to address the motivating goals for this project at a later date. This page will remain a source for philosophical materials concerning race.